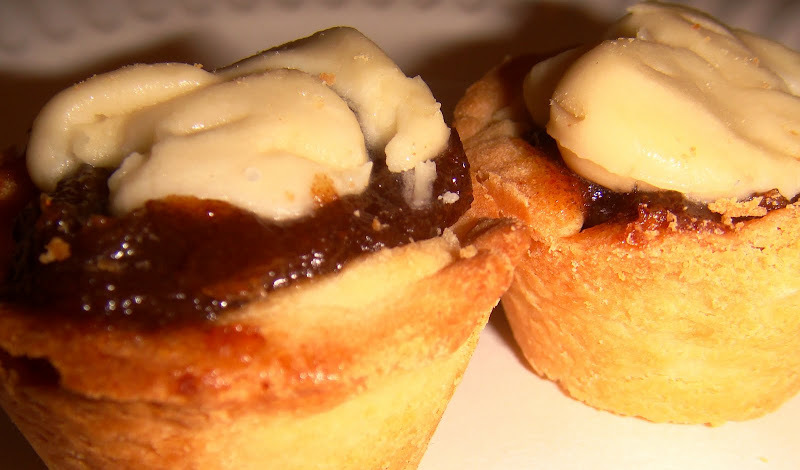 When I was little we visited Cape Breton, Nova Scotia and had these yummy "Pork Pies". They are a sweet treat and not a savory food like the name might imply. I recently came across the recipe on the internet and combined a few to make my own version of Cape Breton Pork Pies. Mix the flour and powdered sugar. Cut the butter into small cubes and kneed into the flour. Within a few minutes, you’ll get an (almost) greasy ball. Roll dough into small balls and flatten. Press the dough into small muffin tins (like the ones I used for Baby O's birthday cupcakes). When you’re pressing you can make the shell thin because it will expand as it cooks. I made 30 shells. Bake at 425F for 10 minutes. Let cool. I think these taste best when put into the fridge for a day or so. I know, aren't they good!